The curanderos of northern Peru, traditional healing specialists who invoke Jesus Christ and the saints with a mescaline sacrament and a shamanic rattle, are not vestigial curiosities nor are their patients rural illiterates without access to "modern medicine." Instead, many of these shamans have thriving urban practices with clients from all levels of society. Sorcery and Shamanism documents the lives and rituals of twelve curanderos, offering a perspective on their curing role and shared knowledge. Authors Donald Joralemon and Douglas Sharon also consider the therapeutic experiences of over one hundred patients, including case histories and follow-ups. 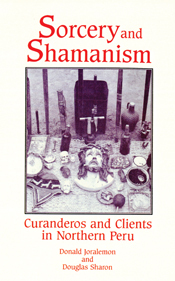 They offer a broad view of the shamans’ work in modern Peruvian society, particularly in connection with gender-based conflicts. The significant work goes a long way toward dispelling the stereotype of shamans as enigmatic and wise, showing them to be pragmatic curers confronting the health effects of everyday aggressions and betrayals. Donald Joralemon is professor of anthropology at Smith College. Douglas Sharon is director of the San Diego Museum of Man.